I made this bandsaw bowl. Video of the process is here! It is made out of a piece of pine board (usually used for shelves). #PINEISFINE. But any board would work. This is the first time I made the circular design and I like the way it turned out. 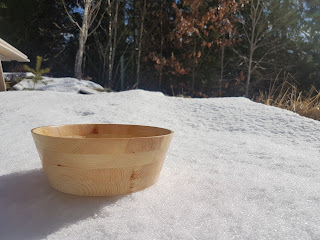 Usually these bowls and trays are made with a scrollsaw. But a thin bladed bandsaw works too. In the video you can see that I use a cut-off to trace the angle of the blade on the bandsaw. Then I use a square to trace two lines. So the thickness of the bowl depends on the angle and thickness of the wood you are using. I try to show how to get the thickness of the circles without calculations. The angle for this bowl is about 20 degrees. I used ordinary wood glue (PVA?) and let it set over night before sanding. If you are doing this bowl please consider the grain direction. Thats why I made the arrows. So when you make the glue up, look for the direction of the grain in the rings. TIP: When cutting lines, circles or anything on the bandsaw, try to keep the piece in motion all the time. Every time you make a stop to make a turn or make a new grip there is a risk it will be a small ridge in you cut line making it a bit jagged. I sanded the outside and inside with 60 to 240 grit, and used steel wool before the finish. For finish I used spray lacquer with some sanding between coats. Thanks for watching, please subscribe to my YouTube Channel, follow me here or on Twitter. It is much appreciated!